How the Bluff Creek Croucher Video was taken. In this photo the camera only caught the leg and foot of the film subject. Vaguely, toes can be made out that are extraordinarily long. Another example of long toes are the Yahgans of Tierra del Fuego. Follow the arrow from the large toe of the creature to the large toe of the Yahgan. After taking video downstream, I took three stills, with this one containing part of the subject. It appears to be the leg and left arm. When I brightened this the texture of the left arm became apparent…and it was hair. The brightened image is in the inset. Notice below that the object laying on the ground beside the Croucher is gone in the photo below. The subject is turned away from the camera and appears to be struggling with something living. It tries to keep the cloth on it but the dark color can be seen over the left side and it appears to kick the cloth from the other side. What is it? The Bluff Creek Croucher Video…A Look at the Anatomy. These two stills show uniform texture over the entire body. The leg and left arm can be examined for proportions and the head partially shows here. This is at 17:04:01 into the video. The two images below show the full breadth of the back. This fellow is really big. This was taken from the Croucher video at 17:07:16 into the video. The Bluff Creek Croucher Video…Something Animated in the Cloth. This is a clip from the Croucher at Bluff Creek video. 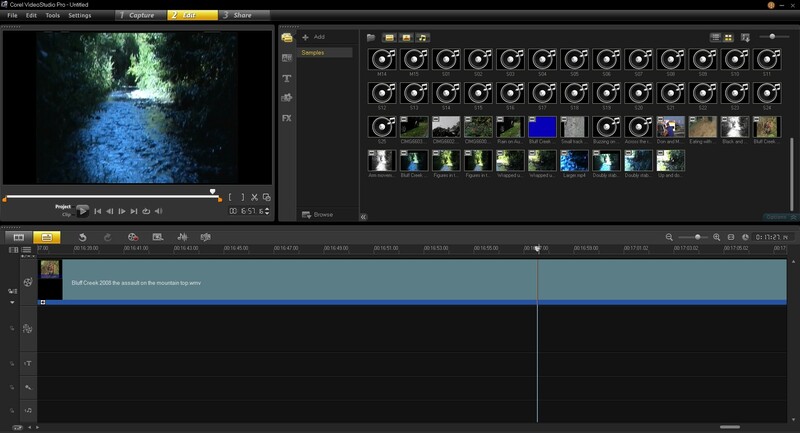 It has been filtered and stabilized to produce the highest possible quality. 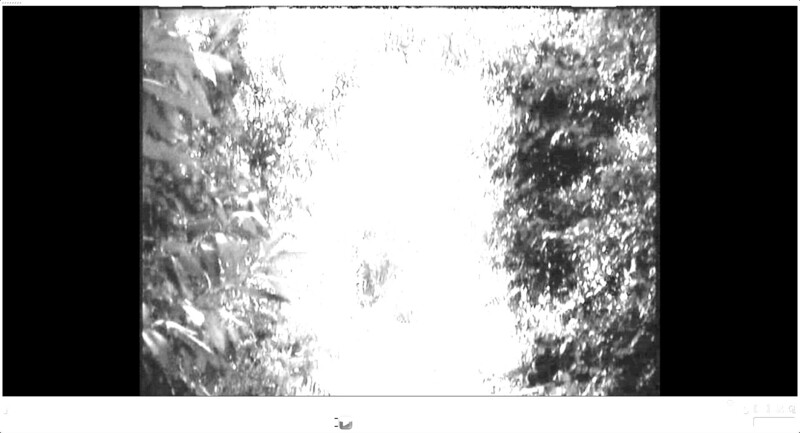 This is a looped file that seems to show some animation to the cloth, in other words it appears to be moving in the Bigfoot’s hands. 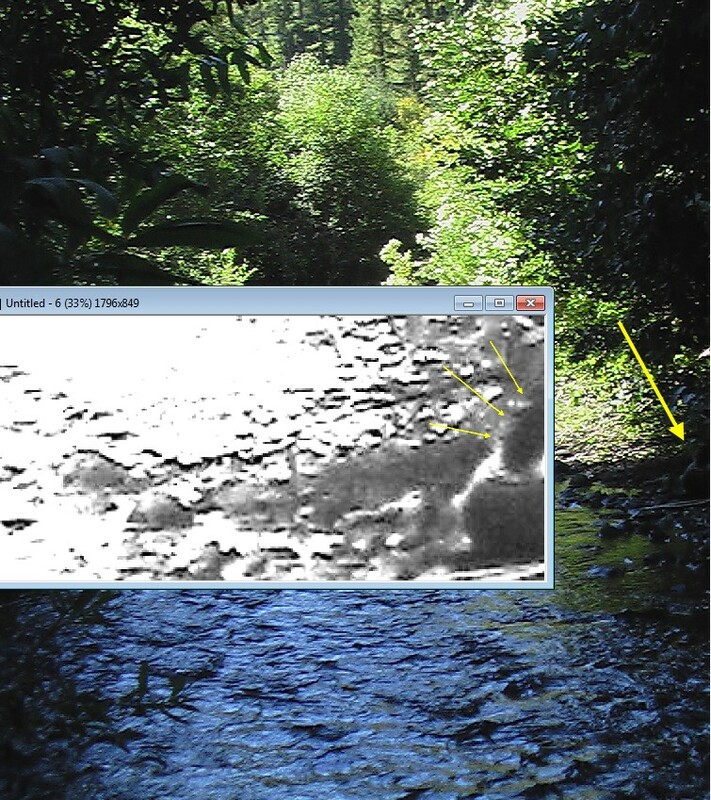 Bigfoot Caught on Tape at Bluff Creek Ca. in 2008. This is a short clip of a video that I took back in 2008 at Bluff Creek California. I did not see this at the time, but upon review I spotted movement at the lower right in the deep shadow area. When I zoomed in and brightened the area was shocked to see that there was an animated figure there. I have diligently brightened and filtered the images from the video and I cannot find any color scheme or lines of demarcation to indicate clothing but rather there is consistent texture over the entire surface of the subject. It seems to be wrapping something in a cloth. This area had thousands of firefighters and support just a few months earlier. It’s not surprising that it found a cloth or rag. The image above is from the Croucher video from Bluff Creek Ca. 2008. It has been specially filtered and brightened. The calf muscle can be seen in the brighter image on the right. This is running at half speed. 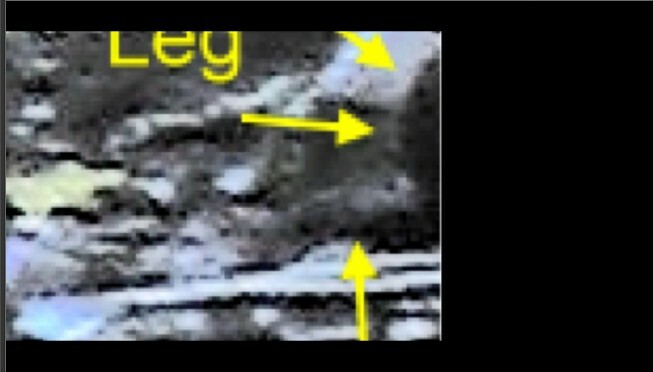 The image above is a still from the raw footage exactly as I saw it when the figure was noticed. You can see how dark the shadows were. This is from a still taken with the same camera taken at 3:38 p.m. central daylight time. The image has been filtered and brightened. The left leg is in a semi- yoga like position with the foot on its side. The top of the left foot can be seen along with what appears to be toe nails. This is raw video from the 2008 Bluff Creek croucher video. This is what I saw through a small LCD view finder.